* Reduce your inventory by 50%!!! * Modular components for unique sizing needs. Our "Stock Saver" hip abduction orthosis provides the same comfortable support and positioning of our Classic Hip with one major difference. Our design innovation enables the pelvic and thigh sections to be easily adapted for use in either left or right handed configurations, eliminating the need to stock lefts and rights. A comfortable neoprene padding is secured to the brace and acts as a wicking interface. Our brace comes with our patented Infinity joint. The pelvic posterior panel design allows it to pivot and more naturally conform to the anatomical contours of the patient. 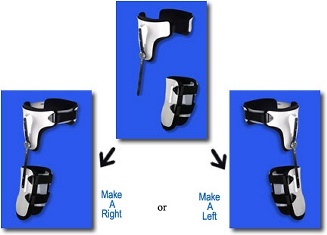 The practitioner can adjust for hip development with the brace on the patient. Stainless steel screws provide a positive lock.